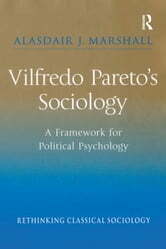 Vilfredo Pareto is a key figure in the history of economics and sociology. His sociological works attempted to merge these two disciplines through a psychologistic analysis of society, economy and politics. 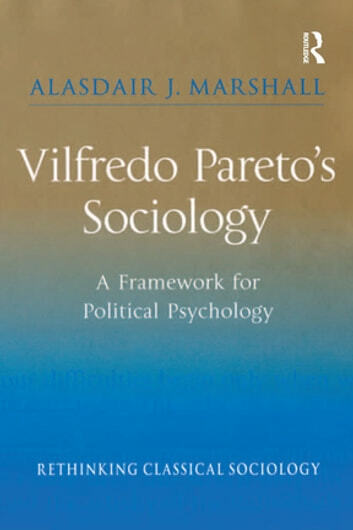 This is the first book to rethink Pareto's contribution to classical sociology by focusing upon its psychological underpinning. The author locates the origins of Pareto's psychologistic approach both within the history of Italian thought and within Pareto's own experiences of business and politics. He evaluates Pareto's sociology through the lens of contemporary social science, examining whether its explanatory power is growing rather than diminishing as levels of social and epistemological complexity rise. The volume also explores Pareto's assumptions about personality through the lens of contemporary psychology. It concludes with a psychometric study of Westminster MPs which clarifies and attests to Pareto's contemporary relevance, and indicates that even practitioners of politics may gain much from reading Pareto.